The bi-folding door meets the demands of contemporary living and combines this with beauty and practical functionality. These aesthetically pleasing door panels are configured into a number of concertina folds that can be pulled back to offer optimum versatility, light and access into any room. 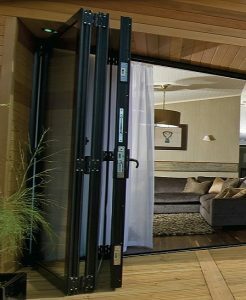 Where an opening or partition is required between rooms, whether a small or large room, or where your home leads onto a patio or outside area and you want to extend your view of the garden, the bi-fold door is ideal for these applications. Bi-fold doors create synergy between rooms of all shapes and sizes to seamlessly connect your living space whether indoors or outdoors (click here for prices and designs). Canopies provide shelter from the harsher elements of the weather, providing that essential protection when entering the home and keeping some of that weather from entering with you. They also provide a more welcoming and protective space for others who come to visit. 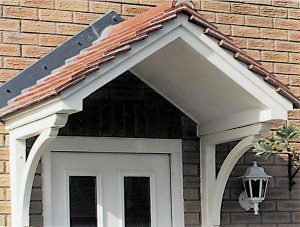 Canopies are not a new concept and are found as a traditional feature in many older properties. Often associated with pillars and other decorative features, they add sophistication and class to a home. Stuart is able install for you everything that’s required to complete a successful refurbishment of your home’s roofline. This can include fascia’s, soffits and rainwater goods (guttering and downpipes), all of which are available in a range of different sizes, colours and profiles to match your needs. A full makeover might also include cladding (not only decorative and protective, but offering additional thermal insulation) and the increasingly popular dry verge system. Dry verge is installed to the gable end of your house to prevent against the natural weather damage caused by the cycling of wind, rain and the sun, the result of which cracks the pointing. Cracked pointing allows moisture into the roofing system, causing untold damage, and inevitably becomes a costly repair situation. Therefore, this product can be a real roof saver.